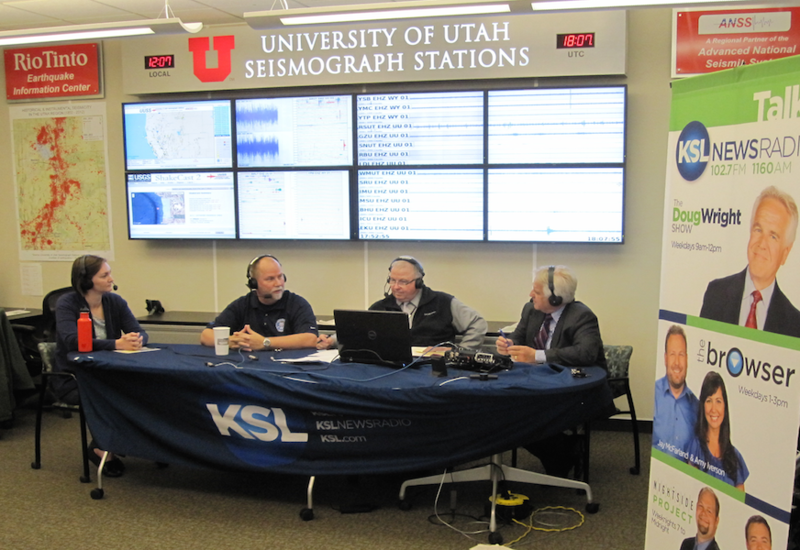 The University of Utah Seismograph Stations (UUSS) capitalizes on a state-federal partnership to conduct research, education, and outreach related to earthquakes, seismic monitoring, and seismic safety in the Utah region. As a founding member of ANSS, UUSS shares in the mission of providing prompt and accurate information related to seismic events, including their effect on the built environment. Notable UUSS partner agencies include the Utah Geological Survey, the Utah Department of Emergency Management, and the Utah Seismic Safety Commission. Seismic hazard in Utah is highest along the north-south trending Intermountain Seismic Belt, although significant seismicity occurs throughout the state. Seismic risk in Utah is acute because 2.3 of Utah’s 2.9 million residents live in the Salt Lake City-Provo-Ogden urban corridor, literally adjacent to the Wasatch Fault. Paleoseismic studies have found evidence for at least 20 M~7 earthquakes along the central segments of the Wasatch Fault in the last 6,000 years. UUSS operates and maintains a combined urban-regional network (UU) of 194 seismic stations, which generate 632 distinct channels of data, to monitor Utah seismicity. The continuous 100 sps data are archived locally at the UUSS Earthquake Information Center (EIC) as well as at the IRIS DMC in Seattle, WA, from which they are publicly available. The Utah network is designed to be robust with respect to power and telemetry failures. Redundancy is provided by 6 overlapping data collection nodes and 13 mountaintop relay sites. A hot-backup site for the UUSS EIC exists in Richfield, Utah, ~260 km south of Salt Lake City, and additional backup is provided by the NEIC Golden, CO. Since October 2012, UUSS has used the state-of-the-art ANSS Quake Monitoring System (AQMS) to detect and locate seismicity in the Utah region. In a typical year, UUSS locates over 1,500 earthquakes in the Utah region: 1 in the M4 range, 12 in the M3 range, and 130 in the M2 range, with 20 earthquakes reported as felt. For earthquakes larger than M3.5, full moment tensors are estimated by inverting broadband, regional distance waveforms. UUSS also routinely computes ShakeMaps for events larger than M3 or M3.5, depending on location. With additional support from the USGS Volcano Hazards Program, UUSS maintains a second seismic network in and around Yellowstone National Park. Operations for the two networks are integrated, with, for example, both using the same instance of AQMS. The Yellowstone network is smaller than the Utah network (UUSS operates and maintains 27 stations with 93 data channels in Yellowstone), however the seismicity rate is higher than in Utah. In a typical year, UUSS locates over 1,700 earthquakes in the Yellowstone region. 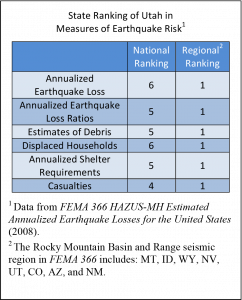 More information about Utah’s earthquake threat can be found in the “Putting Down Roots in Earthquake Country” and the USGS Fact Sheet about earthquake probabilities along the Wasatch Front.